The golf course is scary. You have to wear certain clothes, worry about etiquette and rules and always be conscious of slow play. It's really not the best place to learn to hit a golf ball! 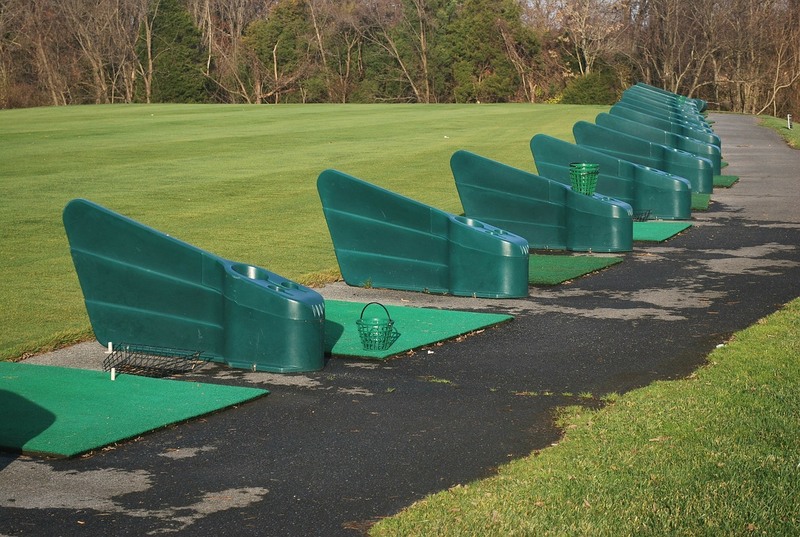 A driving range is perfect for beginners to learn how to hit a golf ball. Stand in one place and just reload without losing any of your own golf balls! Endless golf balls you don't need to go search for! The glossy golf magazines are the number one reason you'll fail to improve at golf because you'll get shiny object syndrome and want to try every new trick in the book. I know, I was there. The day I stopped reading those filthy magazines was the day I started playing good golf. No more negative thoughts in my head or trying a new way of swinging because I saw David Leadbetter or Butch Harmon's latest attempts at screwing up my swing in Golf Digest. 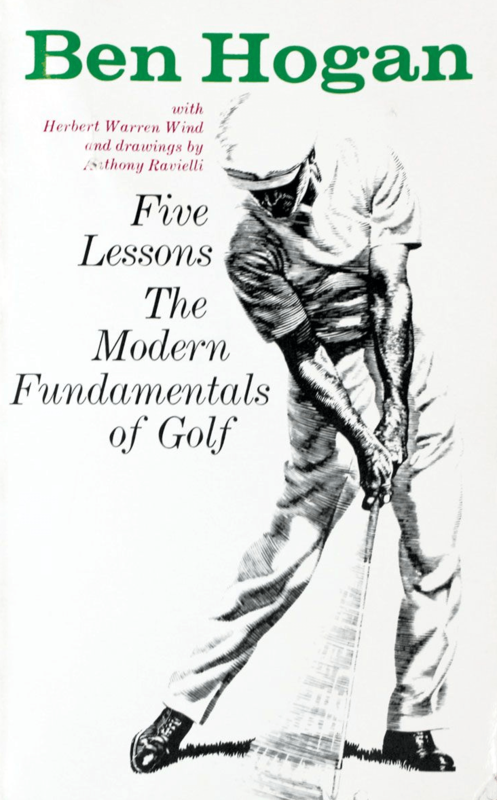 Despite being published in 1957, it's highly relevant to modern golf and the starting point for a lot of good golfers. I started the game in 1997 loaning this book book from the library. Instantly I saw my game take off to register my very first handicap of 21. After following the principles of the great Hogan's book, I was a 9 handicap in two years with very old hand-me-down golf clubs. Follow one teacher and learn only from him. Bouncing around to new instructors will mess you up quicker than a marriage to Tiger Woods. Hogan is a perfect start. Going to the driving range is fun and whacking some balls can really de-stress you, but doing it wrong can make you feel worse! Our vision is to make golf fun for you whatever level you play at so below we've outlined how to use the range to get better while still having fun. You'll be able to take what you practice on the range to the course and blow your own socks off and have some serious fun. This is an excellent video to teach you the basics of the grip. In the Ben Hogan book above, you'll find a similar lesson. I seriously encourage you to get the book so you have a hard copy with you as a golf bible. You should put in 30 minutes a day for one week working on the grip. That's how important this is as a fundamental. 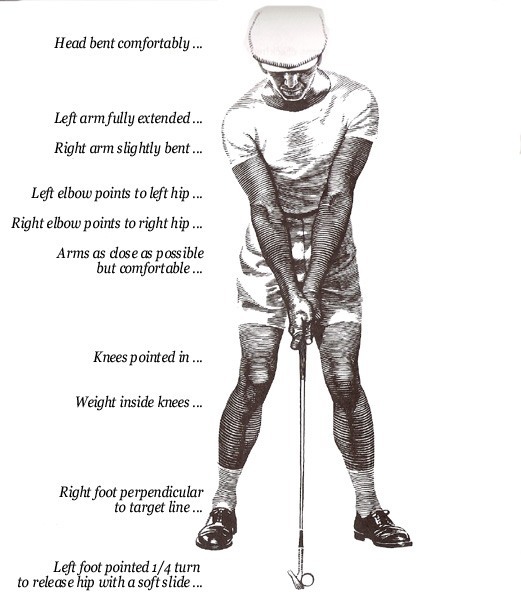 In Ben Hogan's book, you'll find an illustration like this. 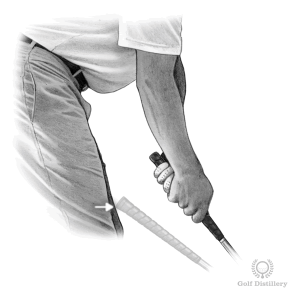 The ball gets closer to your body as the club gets shorter. Your stance also narrows as the club gets shorter. A lot of teachers will tell you to move the ball progressively further back in the stance with the shorter clubs but this complicates so many things. As a beginner we want to simplify your game for maximum enjoyment! Eventually your body will recognize the right distance from the golf ball and you can stop actually placing the club on your knee. It may take a few months, but you'll get there. I did. This is a perfect illustration from Hogan's book of the ideal set up. You need to work on having a relaxed setup and posture. Very important is to not hunch your shoulders forward like Quasimodo. Your weight should be on the balls of your feet, just behind the big toe and not on your heels. Once you master the grip, stance, ball placement and posture, you'll be seriously enjoying golf. Follow Hogan's simple instructions and forget about the other noise you hear from people at the course or your friends who think they know everything about golf. It's not easy to align your body and golf club to the same target. You might feel like you're aiming correctly and you probably are but not correctly for golf! See, what happens is most golfers aim their feet at the target. 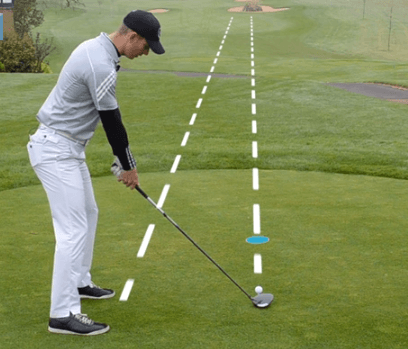 While the club face must aim at the target, you actually want to line up your feet parallel to the line of your club face, like railway tracks. Notice the blue disk in the picture. That is a point along the line from the ball to the target that you can easily align your club face to. 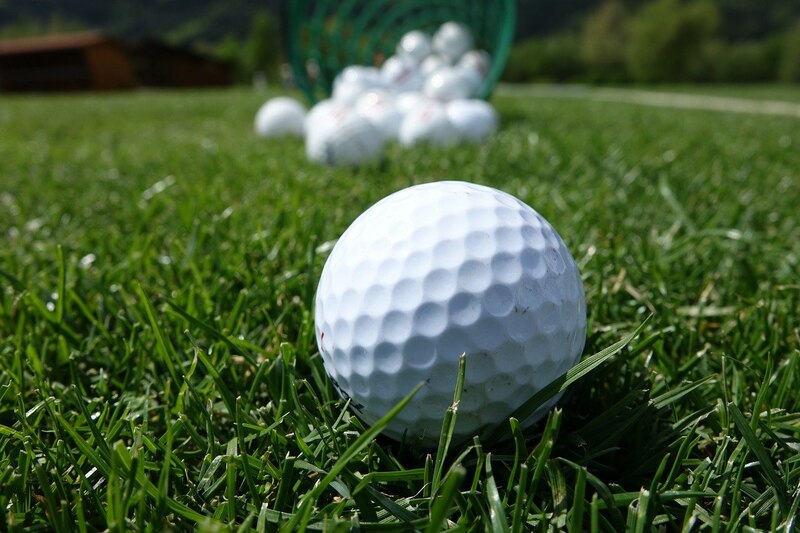 It's difficult to aim your club to a target 200 yards away, but by selecting a dot or blade of grass a few feet from the ball will make it much easier. So on the driving range, we recommend you lay down two golf clubs parallel to each other. One should point just right of the target and the other should point just left of the target. Select a spot a foot or so in front of the ball to aim the club face and make sure your feet align with the club closest to you. 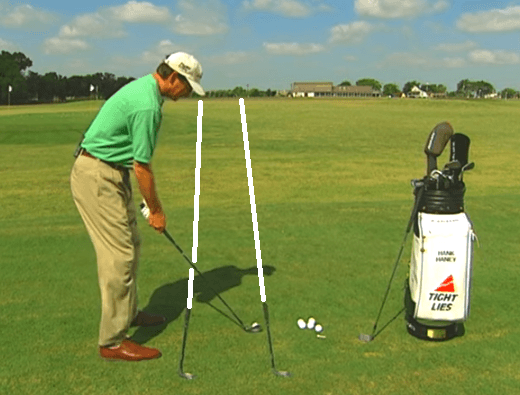 This drill will do wonders for your alignment and confidence! If you want to be fancy, you can get some alignment sticks to use on the driving range. They're usually bright in color, lightweight and easier to align than clubs. I always used clubs but after receiving bright orange alignment sticks as a gift, I changed my mind and realized how much easier it is to use them. Once you're comfortable with the grip, posture, ball position and alignment, you probably want to whack as many drivers as far as you can! Slow down there partner, we need to build up to it. 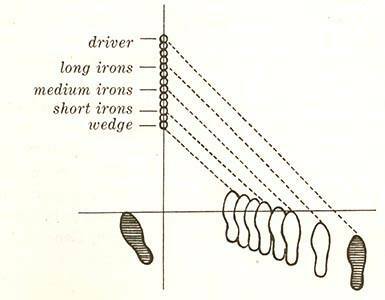 Once again, learn the fundamentals of a sound swing from Mr Hogan in his book above. Most golfers are self-taught and usually ingrained with terrible habits they can't remove. If you can afford a lesson or three, go see a pro to get your fundamentals set. It's a great investment to build the foundation for the rest of your golfing career. If it's a little steep for you, you can still learn this game without the help of a pro. I played off scratch for a while in my 20s and have only ever taken one 15 minute lesson because I forgot how to hit a driver. Don't try murder the ball on every shot. This leads to terrible shots, frustration and blisters. Use a 75% effort swing and focus on hitting down on the ball and hitting the ball before the ground. This is easier said than done but once you get the hang of it, you'll start hitting longer and nicer feeling shots. I suggest hitting range balls with only a pitching wedge and a 7 iron. These are 2 of the most common clubs you'll hit on the golf course so get confident with them first. The pitching wedge has a lot of loft and is easy to hit giving you plenty of confidence hitting the sweet spot. Seven iron is a little more difficult to hit but probably everyone's favorite iron in the bag. Start the bucket off with the pitching wedge and hit a third of the balls always focusing on a smooth and easy swing. Hit the next third of the bucket with only a 7 iron. Finish off the balls with another round of easy pitching wedges. DO NOT RUSH! The worst thing you can do for your progress is rush your sessions at the range. Take your time. Take up to 5 minutes between shots if you want to. That's what it's like on the course where you're waiting for other guys in front of you and in your group to hit. Put the cell phone away and forget about the wife and kids! Once you're confident with these clubs, start introducing the others from your bag into the range sessions. A pre-shot routine is what you do right before you hit. It starts from when you pull that club out your bag. From that moment, you need a little routine that gets you into the mindset of hitting a shot. You must have something that makes you feel comfortable and centered. The importance of the pre-shot routine can't be underestimated! This takes me no more than 15 or 20 seconds. If I don't do it before every shot, I hit a bad shot. Pre-shot routines get you in the comfort zone to hit the ball well - kind of like a brain association game. Always aim to have an efficient pre-shot routine that isn't excessively lengthy so you don't slow down the pace of play. With these few steps containing a few tips and drills for beginners on the driving range, you'll be able to maximize your efficiency and really start to hit better shots. You'll build in confidence and that confidence will translate into better scores and more fun on the golf course. Like I said earlier, get your hands on the Ben Hogan's book on the Fundamentals of Golf and watch your game improve dramatically! A grass range is always preferable. You see the real result of your shots. At an artificial turf range you are able to hit the ground before the ball and still get a good result. If you're concerned about that, start off with the artificial turf range and once you get a feeling of how to get the ball in the air consistently, move onto the grass range. Clothes: Wear whatever you like because there's no dress code. Pay for a bucket of balls from either a cashier or a vending machine. 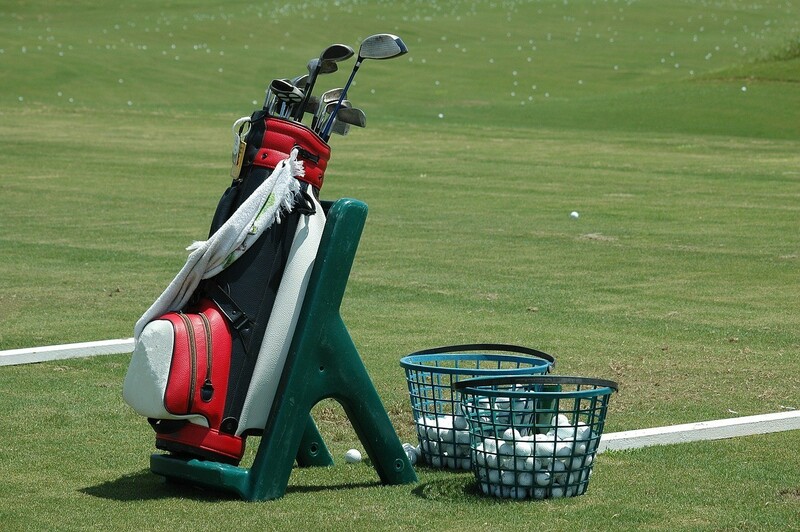 Take the bucket and your clubs to a hitting bay and hit the balls onto the driving range. Easy. Safety of others is always the number one concern. While some people think it's funny to hit golf balls at driving range employees picking up balls, imagine being in their position. When someone is picking up balls, aim anywhere but at him. Pick a club that won't reach them. Try to pick a bay near the ends of the driving range so you can feel comfortable no one is watching you. This also means you can hit without endangering others with some of the crazy shots you'll hit as a beginner!